It seems there's a current marketing trend that involves vanilla and chocolate items together in the same package, like: TJ's Coconut Macaroons, Archer Farms Cake Balls, and now, these happy little French "macarons." Perhaps they're making a statement about peace among diverse peoples. Like Seinfeld's Black & White Cookie, maybe they're "two races of flavor living side by side in harmony." However, I'm going to cut that metaphor off right there, for fear of being labeled a vanilla supremacist. Because Sonia (who is not white, by the way) and I both agree that the vanilla macaroons in this box were better than the chocolate ones. Like waaay better. Sonia, who is inclined to like chocolate more than vanilla under normal circumstances, pointed it out first: the chocolate macaroons' texture was weird. We gave them plenty of time to thaw. We even left one out for an extra half hour at room temperature. Still weird. They tasted ok. But the chocolate creme centers were chewy. Sonia, who is full-blooded Zapotec Native Mexican-American Indian Hispanic and most definitely not Caucasian, noticed it too. By contrast, the vanilla ones melted in our mouths the same way the Pumpkin Macarons did. The vanilla ones were light, soft, fluffy, and tasted like sweet clouds straight out of heaven. This guy's a macaroon bigot! I'm not I swear. Though I am rethinking that racial metaphor at the top of this post. But try as I may, I just didn't like the chocolate ones. I feel like I'm being generous giving them 3 stars out of 5. Sonia gives them 3.5. Which is still pretty low for her. So the chocolate ones would get a score of 6.5 just by themselves. Bottom line: 7.75 out of 10. -Ancestors on both sides of his family fought for the Union in the Civil War. -He lives with his non-white wife in a highly racially-integrated suburb right outside of Philadelphia, Pennsylvania. Don't worry - my husband and I found the same thing and we're both 'chocolate people'. We actually fight over the vanilla ones. So good! I love these parisienne chocolate/vanilla macarons; in fact, they were in my list of top 10 favorite things from Trader Joes for the longest time. Therefore, I was excited to find out that the Trader Jacques line just recently (this past month, I think) came out with other flavor macarons! There are two of each of the six following flavors per box: caramel, coffee, pistachio, raspberry, orange and cassis. The pastel colors are so pretty, and I think they taste so good that they even knock the parisienne chocolate/vanilla ones off my aforementioned top 10 list (although I'll admit I'm not fond of the raspberry ones because of the seeds). 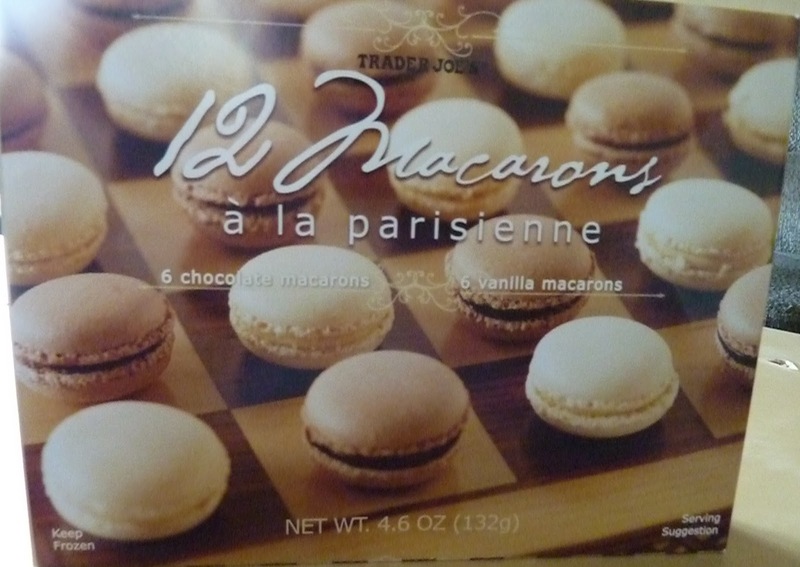 The Trader Jacques macacrons are also $4.99 for a box of 12, and also need to be kept in the freezer like the parisienne chocolate/vanilla ones. I currently have 6 boxes in my freezer and am crossing my fingers that Trader Joes doesn't stop producing them anytime soon. I hope you try the Trader Jacques macarons and give us your opinion about them too. Thanks, fashionjarmoneyjar! We will have to check those out! I liked the vanilla ones way better too. The chocolate cookies were too hard more like meringue cookies. Agreed, I tried these last night, the vanilla are 100% better. I've also had the multi flavor ones, they're pretty good. These will do in a pinch, they're not expensive and they're tasty. The bakery down the block from me (San Francisco) makes a salted caramel that is like crack on a plate. Worth walking miles to get one. Glad I'm not crazy, Crystal and rf1926! I just tried these for the first time the other day. I thought the same thing about the vanilla being better than the chocolate at first, but then I let the chocolate ones sit out for hours (like 6, because I went to work). I came back to them, and they were as smooth, light, and fluffy as the vanilla is when it first thaws out. You just have to give the chocolate more time to thaw since it's thicker in the middle I guess! So yummy. Have you tried the Pumpkin Macarons? So good! I easily get overwhelmed by anything pumpkin so I am able to stop myself after a couple. Macarons and macaroons are two completely different cookies, not different spellings of the same thing. Want to watch deliciously delicate cookies that our family is crazy about disappear? It's like Russian roulette with these in our family. There's 12 in a box, 4 in our family so we start from the youngest to the oldest and everyone chooses one cookie at a time until all 12 are gone. The kids usually pick the basic flavors and leave fig and pistachio for the us(our fav - lol). All cookies disappear within minutes. Great treat for all occasions!